CARRIE MILLER PHOTO | Medical workers load a dirt bike crash victim into a Medevac helicopter Thursday afternoon off Elton Road in Riverhead. A man was airlifted to an area hospital Thursday afternoon after crashing a dirt bike in woods off East Main Street in Riverhead, officials said. The man, identified by police as James Bennett of Riverhead, crashed into a tree about 5:10 p.m. in a wooded area just west of the Millbrook Gables neighborhood, south of Route 58, said Riverhead Volunteer Ambulance chief Joseph Oliver. 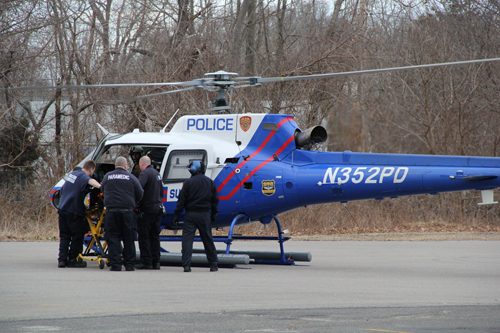 A Suffolk County Police Department helicopter landed in the parking lot of True Tech Inc., adjacent to the woods, and Mr. Bennett was then transported to Stony Brook University Medical Center. Mr. Oliver said the victim and other young men were driving vehicles in the woods at the time of the crash. No other injuries were reported. “As of [Thursday] night he was stable,” Riverhead police Detective David Freeborn said of the victim Friday. He added that the other people involved, believed to be at least five, fled the area after the crash, leaving Mr. Bennett there, injured. The bike was gone as well when police arrived. It’s not known who removed it. The decision was made to transport the man via helicopter because of the nature of his head injuries, officials said. Reached Friday, Ms. Bennett’s mother asked only that people keep her son in their prayers. Should Planning Board member have abstained from vote?